Today, many prefer domestic heating with a gas boiler. This is not surprising - the gas is the cheapest fuel. However, the exhaust gas should be displayed. To do this, create a gas flue. Gas chimneys are designed to exhaust combustion products and to ensure the normal operation of heating equipment. The company "Wind Rose" offers its clients a professionally made durable and reliable gas chimneys, or, as they are called, flues. Our specialists will calculate and develop for you the most efficient and safe model of the flue depending on the size of your gas heating boiler. Gas boilers are wall and floor. Wall usually have small dimensions and are mounted on a wall or septum in the room. Flue for them - it is a separate exhaust pipe is horizontal, facing the street, through which the exhaust gas of gas. For natural ventilation chimney is needed, through which under the influence of natural draft flue exhaust. Floor boilers volume, so they are placed directly on the floor. For them, provide vertical or horizontal exhaust pipe. We produce chimneys for gas boilers of heat-resistant stainless steel. It is known that the combustion gas is like a neutral substance - carbon dioxide and water vapor. But it contains sulfur impurities. Reacts with water and air, the impurities are oxidized and converted into a weak solution of sulfuric acid in the vapor state. Sulfuric acid corrodes the chimneys of brick or regular steel, and their service life is 2-3 years. The optimal choice for flue gas could offer a "wind rose" - a stainless steel grades AISI 304, AISI 321, AISI 316 - especially acid-resistant stainless steel AISI 316 L and molybdenum content. It withstands high temperatures many acids, even boiling. Our stainless steel flues made with perfectly smooth inner surface of the chimney. On such a surface will never settle soot. Another important factor for the selection of the gas flue in stainless steel is the "dew point", ie The temperature at which the steam is converted to water. Stainless steel chimneys does not accumulate condensate, and the condensate does not constitute a "plug." they are easy to install and maintain. They take up little space and saves space. of good quality and long battery life. we are able to combine t flue pipe with different models of boilers. Our flues have a modern and sleek aesthetic design. We create flues with a round and rectangular - the customer's choice. Our masters in the calculations take into account the area of useful cross-section of the pipe, which must be greater than the inside area of the boiler. It is important that the diameter of the inlet duct of smaller diameter was included in a structure. In some cases, the products interconnected adapters or nozzles. The following is to calculate the height of the chimney, which is dependent on the location relative to the ridge of the house. You must also calculate the correct length of the flue to make it work efficiently and smoothly. And, of course, it is important to identify the most successful arrangement of the flue in the house - from the inside or outside, he will be. Installation of the chimney requires a separate sealing all joints with special heat-resistant sealants. This will prevent leakage of exhaust gases and dust in the room. In addition to the basic equipment flue (chimney), we create all the necessary additional elements: adapter from the nozzle of the gas boiler to the chimney, tees with the audit and fittings for condensate removal, wall brackets and clamps, communicating pipes, bends, telescopic tube and more. All these complex operations and calculations skillfully produce our highly skilled engineers and craftsmen. The "wind rose" a lot of experience in the creation of flues, so we are confident in the excellent quality of our products. We comply with all safety requirements and proper installation, allowing you to protect the lives and health of our customers, and extends the life of the gas boiler. correct assembly of all elements of the chimney. If the chimney passes through the construction of the house, you must install a special walk-through elements. reliable isolation of all surfaces that come into contact with combustible materials. If the chimney goes out, it must be equipped with a heater to prevent freezing in winter. We offer to buy a chimney in the "wind rose" because our gas flues meet the modern requirements: high reliability, full safety operation, maximum efficiency, ease of installation and operation. The cost of gas conduits are in a harmonious relationship with their high performance. Our chimneys are made by professionals, so in the absence of heat, we can help to heat your home and save you money. The development of boiler technology and the emergence of boilers operating without the use of room air led to the creation of appropriate structures for the removal of flue gases, which simultaneously perform two functions: flue gas discharge and combustion air supply to the combustion chamber of the boiler (Figure 14). Such designs are called air-gas chimney systems or abbreviated LAS (from the German "Luftabgassystem"). LAS systems serve boilers with closed combustion chambers that run on natural gas and can be used in both individual and multi-family homes. side-by-side structures when the flue gas sump is located next to the air supply shaft (c). In turn, concentric designs can be prefabricated (individual elements from different manufacturers), or complex (all elements from one manufacturer). Next-standing structures include prefabricated, integrated and ceramic chimneys. LAS systems have high fire safety requirements. Fire resistance of the air supply duct in the flue system of concentric construction should be not less than 90 minutes, in residential buildings of small height - not less than 30 minutes. Wolfshoher Tonwerke ceramic pipes are successfully used in both designs. The main elements of the self-supporting column of ceramic pipes installed in the mine are: a base with condensate drain, a tee for inspection and cleaning, pipes of the required height and a kit for connecting the consumer. Connecting the boiler to the ceramic pipe can be done at any elevation, including at the junction of the two pipes. 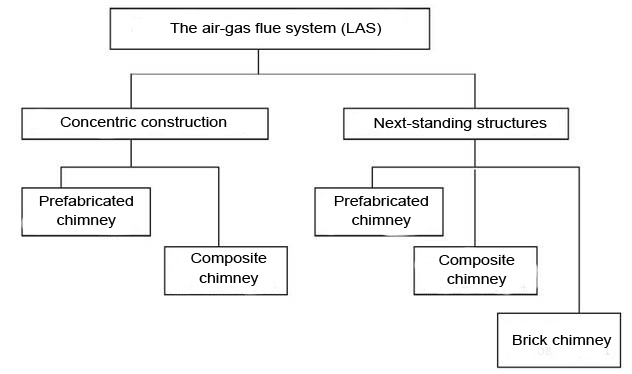 In LAS systems of concentric construction, the connecting element from the boiler to the chimney is a coaxial pipe (pipe in the pipe), in the systems with separate shafts from the boiler there are two pipes: one for air supply, and the second for flue gas discharge (Figure 15). To connect the boiler to the chimney of ceramics, a LAS element with a set of adapters of different cross-section is used (Fig. 16). Adapters allow you to choose a hole corresponding to the section of the branch pipe for flue gas discharge of the boiler. 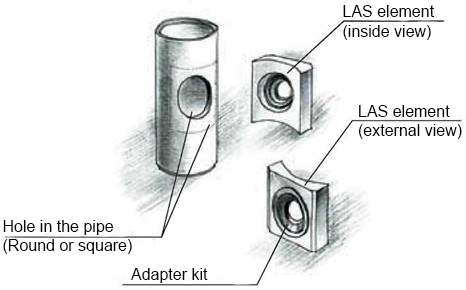 To connect the LAS element in the pipe, a hole must be made. It can be round, 11,5 - 12 cm in diameter, or square 11,5x11,5 cm. On the back side of the LAS element is applied an acid-resistant mass, then the element is fixed on the pipe, and after 24 hours the connection is fully ready for use. Pipes for connection of the LAS element can be delivered to the customer with ready-made holes of the required diameter made at the factory. Holes can also be cut directly on the construction site, using a tool widely used in construction: a drill with a diamond crown, an angular grinder (a "Bulgarian") or a drill. For more details, see the "Assembly Instructions". The most widespread LAS system was in multi-dwelling houses, whose residents quickly appreciated its advantages in comparison with the central heating systems: the independence to use the opportunity to choose the most suitable temperature dwelling, pay only for waste heat, the lack of payment for the repair and maintenance of heating plants . Modern boilers connected to LAS systems may be single-circuit (heated water for heating systems) or double-contour (required parameters provide coolant in the heating system and heating of hot water for domestic use). The power varies from 8 to 32 kW. The average technical characteristics of double-circuit boilers with closed combustion chambers used in LAS systems are presented in Table 2.9. In accordance with the current European standards, up to 10 consumers can be connected to one collective chimney, a maximum of 4 boilers can be installed on one floor. The minimum height distance between two adjacent boilers connected to one system at an angle of 90 ° with respect to each other should be 30 cm (Figure 17). An important element of the design is an opening for equalizing the pressure in the lower part of the structure, reducing the pressure difference between the mines and creating a more balanced combustion mode in the boiler. height of construction above the uppermost device. In table 2.10 you will find recommendations for the selection of diameters of the LAS system with an internal ceramic pipe and the dimensions of the air supply shaft. The table is made for wall gas heating boilers with closed combustion chambers. The flue gas temperatures at the outlet from the boiler range from 110-180 ° C at the rated thermal load of the boiler. At partial load, the temperature varies from 65 ° to 85 ° C.